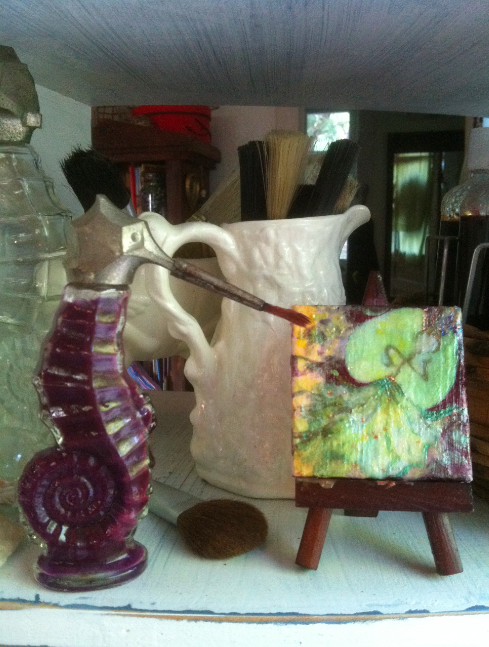 I want to introduce Lotus and her portrait painter, Seahorse. They are not in any books I’m working on right now, but they just keep showing up in my mind. Here is a painting of Lotus, painted with leftover fingernail polish that used to be my daughter’s. In ‘real life’ her dress is made from a large lotus leaf and her body of wire and seedpods. She’s a dancer and can even dance on and with water! Keep an eye out for her for she shows up at the most unlikely times and in the most curious of places!